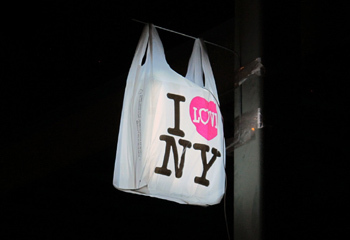 Plastic "I Love NY" bags have joined the motley collection of items easily mistaken for explosive ordinance. As Brooklyn-based designer and artist, Takeshi Miyakawa, found out to his cost, when the NYPD arrested him on Saturday for "planting false bombs." According to Japanese art site, Spoon & Tamago, Miyakawa is currently being held on Rikers Island without bail and a judge has ordered he undergo a mental examination. The pieces are a fairly cutesy example of "guerrilla art." Miayakawa hung the plastic bags, which light up thanks to an included battery-powered flashlight, from trees and lampposts around the city. He was arrested after a local called 311, the city's non-emergency services line, to ask whether he was required to take the art down. The call was forwarded to 911, and the NYPD - who, let's be honest, have a fairly valid reason for being paranoid - responded to the potential threat. After finding Miyakawa half-way up a ladder, they arrested and charged him with two counts of reckless endangerment, two counts of placing a false bomb or hazardous substance in the second degree and two counts of second-degree criminal nuisance. It's worth noting that the NYPD didn't think the art pieces were bombs, as was the case in the 2007 Boston bomb scare, where police officers mistakenly identified battery-powered Mooninites for bombs. Instead, they believe that other people could mistake the art installations for bombs, potentially causing a panic. The NYPD apparently receives nearly 100 reports of bomb-like items a day.